Coming to India I knew I would be met by a country with immense public health issues. Now having walked her streets for three weeks, I look back and am stunned at how a country with so many natural resources can have so many problems with one of life’s most basic necessities: water. Walking down the street, I have to watch where I step as many roads are lined with open sewers which drain into nearby water ways. The intense stench from these cesspools make me hold my breath as I walk by, often leaving a burning sensation in my eyes long after the smell is gone. On days where rain brings what appears to be clean water from the clouds, the lack of a proper drainage systems often leave streets flooded by the open sewers, making them impassable on foot. Looking to the future, if action is not taken India could have less than half the water it needs to support its population in just 15 years time (Vasudev 20). In a country of 1.4 billion people, where over 80% of the population follow a religion which views rivers as holy (Gracey 2017), I find myself asking why India’s rivers and waterbodies are not some of the cleanest and most well preserved on Earth. While in the seaside town of Pondicherry I stumbled upon workers setting up an event called Rally for Rivers, a nationwide campaign to restore India’s rivers. 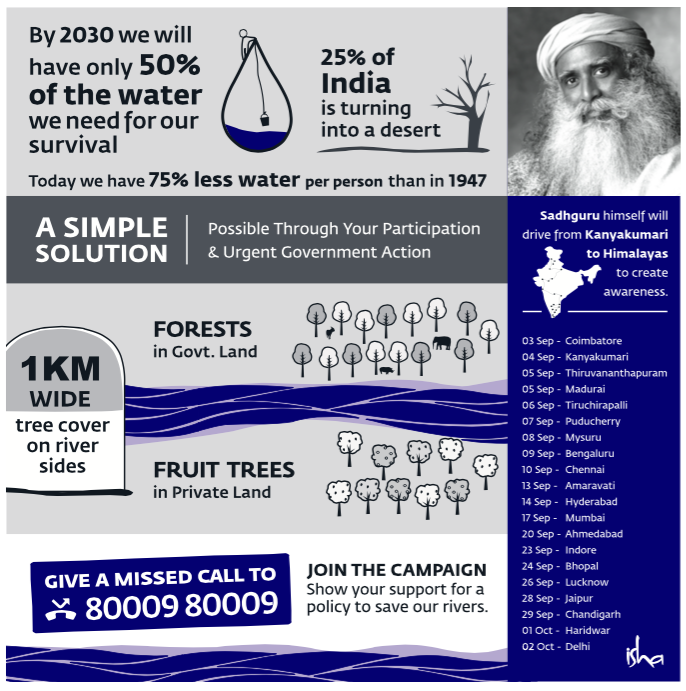 This campaign’s main goal is two fold: to educated India’s population on their country’s dire need to protect their water sources and to implement laws to save the rivers all across the country (Sadhguru 2017). It was started by Sadhguru, a well known public activist in India. Rally for Rivers does not suggest a concrete solution to the problem of pollution. Instead they call for the implementation of a law to solely combat water loss. This law mandates a one kilometer buffer of trees alongside all riverbanks (Moudgil 2017). Rivers will benefit from the planting of trees since they prevent soil erosion and replenish rivers through the intake of groundwater. “The arguments, though not incorrect, are incomplete” (Moudgil 2017). The effectiveness of this law is questioned by many as it provides a way to refill, but not clean India’s waterbodies. While this law solves a piece of the puzzle, it is a mere bandaid to cover up an internal infection. The validity of the campaign as a whole is also questioned by many. Dr. Jayaraman of the Madras Institute of Development Studies calls Sadhaguru’s rally a scam; it does not focus on what ales the river nor does it allow the voices of the affected to be heard. To Dr. Jayaraman, this rally is nothing but a ploy for media attention funded by the vary companies which pollute the river. Rally for Rivers is headed by a man who himself is responsible for destruction of a piece of the Noyyal River (Jayaraman 2017). Pollution awareness is being led by someone who propagates water pollution, showing that it is nothing more than a media frenzy. 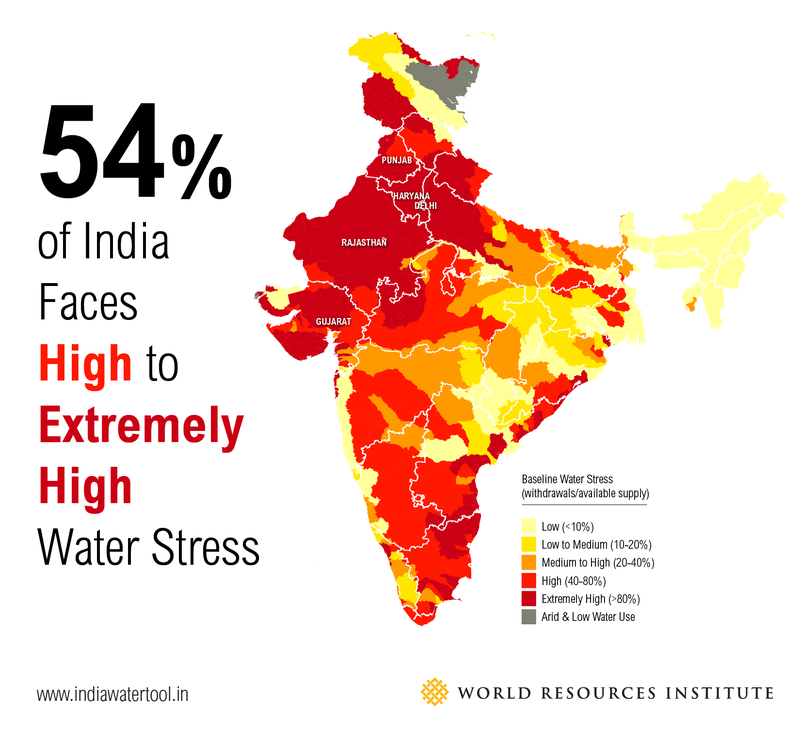 Water is threatened by many facets of Indian society; namely religion, the lack of government protection, and a societal disconnect with the world around them. India’s rivers face many manmade pressures every day. Planting of trees alongside the river banks is not going to clean up harm that has already been done nor will it clean what lies above and below the waters surface. The Ganga, India’s holiest river, is one of the most polluted rivers in the world (Rowlatt, 2016). Dr. Gracey, a professor at Madras Christian College, spoke on the Hindu practice of dumping human bodies and ash into this water source. Religion fuels this pollutant practice because Hinduism teaches that through this practice moksha, the release from the suffering of this life, will be attained. Religion allows this highly polluted and toxic river to be seen as pure, something that will never become impure (Gracey 2017). 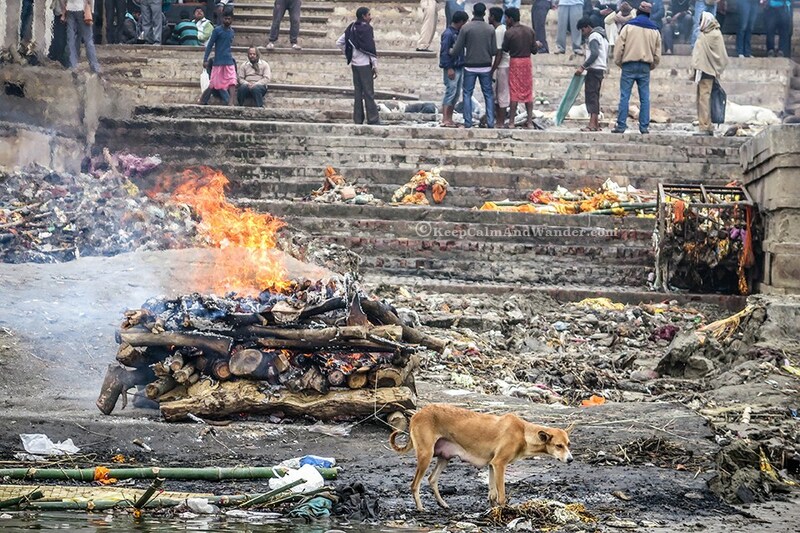 Hinduism is failing one of its holiest sites because of a religious disconnect with science. Although religion plays a part in polluting India’s rivers, it cannot hold the bulk of the blame. A country with 1.3 billion people cannot be expected to regulate itself. The Indian government has failed its people through its inability to enforce and regulate environmental and waste management laws. India has yet to enforce a strict code on the building and maintaining of landfills (Smiley 2017). This has lead to the dumping of trash which includes: municipal trash, car-cases, medical waste, etc. in waterbodies like the Ennore creek and Pallikaranai marshaland of Chennai (Venkatachalam 2017). When this occurs, toxins not only seep into the water around it, but over the course of time, toxins will seep down poisoning the water table (Roja 2017). 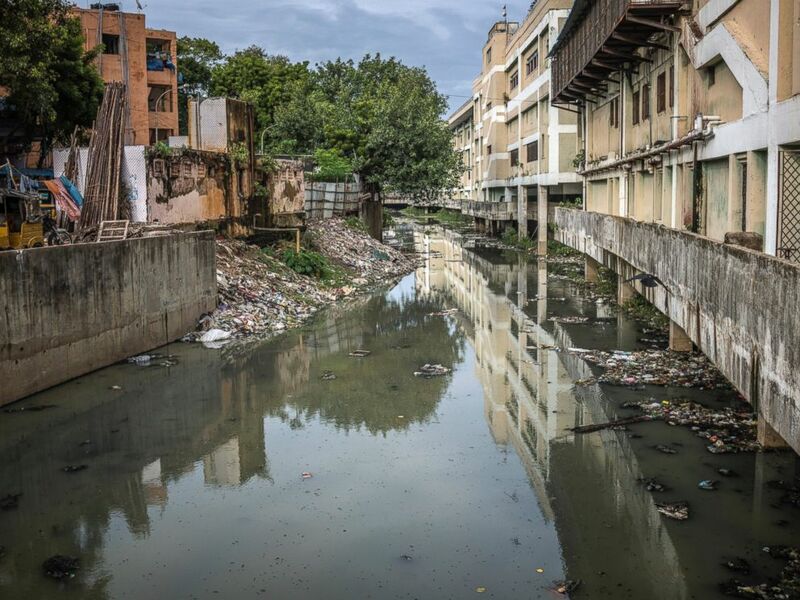 Daily urban India pollutes its waterways with over 43 million liters of untreated sewage (Moudgil 2017). 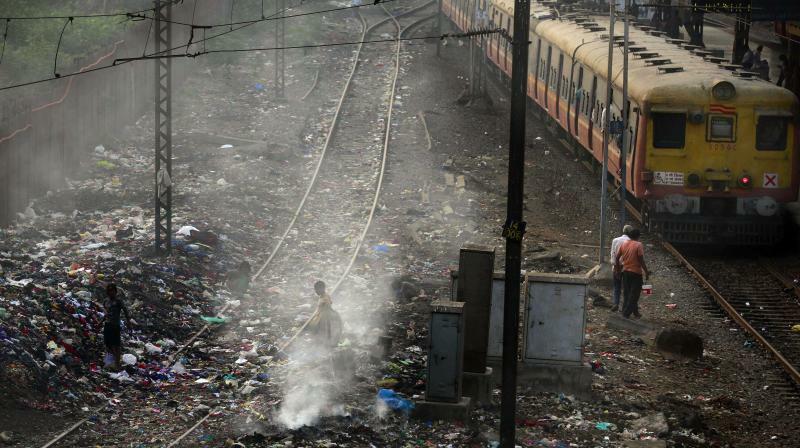 Many lecturers have claimed that India has policies in place to deal with sewage, but they are not implemented. Without enforcement laws are pointless. Dr. Venkatachalam, of the Madras Institute of Development Studies, stated that there is no treatment of sewage in the state of Tamil Nadu (Venkatachalam, “Economic Impacts.” 2017). With untreated effluent being put into the same source from which many cities pull for drinking water, it is mind boggling that the government allows this to occur. India is run by corporates whose focus is on sustained economic development and not sustainability or protecting the environment around them (Prabhakar 2017). Between the government and large corporations, it is hard to know where to start on the individual level. I have yet to see a trashcan on the street, there is nowhere to put ones trash except for on the ground. It is in this most basic need that India’s government has failed those who want to take action. A misunderstanding of reality can be seen in India’s population. I have witnessed people throw trash out of the train, leaving me in complete shock. I wonder how someone could just empty their purse out the window, throwing out piece after piece. Reflecting on this experience, I realize that throwing trash on the ground is what most people know. Most are not doing it out of disrespect for the earth, instead its a lack of understanding the consequences of their actions and a lack of available resources to do anything else. This lack of understanding comes from a long history without a municipal waste system. Dr. Gracey, of Madras Christian College, spoke on this issue pointing out that trash before the westernization of India consisted of banana leaves and other biodegradable substances which caused little harm to the earth. Fast forward to the present and habits have not changed. Societal norms did not evolve with the introduction of plastic and packaging. India’s development was not sustainable because people were not educated on how they too had to evolve with the changing of their habits (Gracey 2017). In a country where killing of holy cows is against the law, why are holy rivers not given the same protection? The death of these rivers, India’s biggest freshwater source, will bring the end of progress. Without water life cannot go on, without water neither can India.The burden of this issue can neither be put on the backs on India’s people, nor can it be left to organizations such as Rally for Rivers who misrepresent the extent of the problem. It is the governments responsibility to take action and save what remains of India’s waterbodies. Jayaraman, Nithyanand (2017) Transformation of the Land and Coast. Lecture, Madras Institute of Developmental Studies, 15 September 2017. Rowlatt, Justin. “India’s Dying Mother.” BBC News, BBC, 12 May 2016. Moudgil, Manu. “Jaggi Vasudev’s ‘Rally for Rivers’ Will Worsen the Problem It Plans to Tackle.” The Wire , Foundation for Independent Journalism, 9 Aug. 2017. Roja, E. (2017) Personal Hygene and Public Health in India. Lecture, Madras Christian College International Guest House, 14 September 2017. Sadhguru. 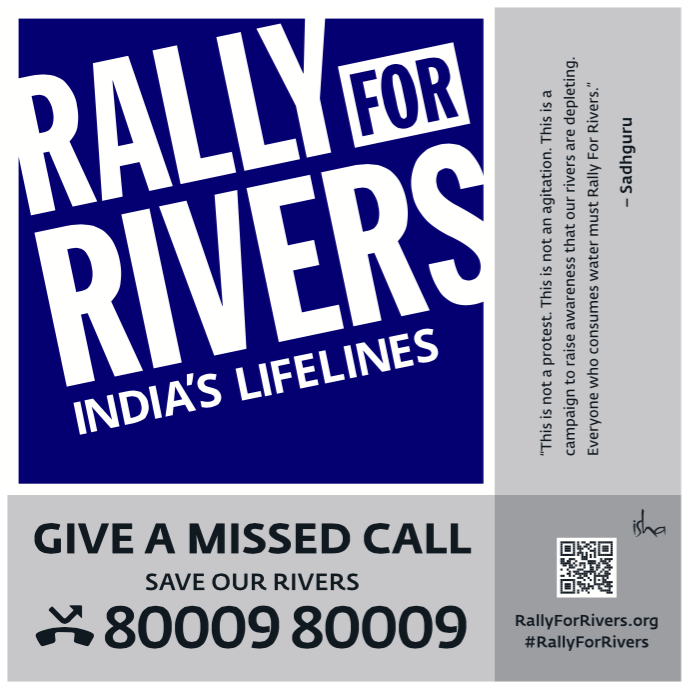 “Our Rivers Are Dying.” Rally for Rivers, Isha Foundation, 2017. Vasudev, Sadhguru Jaggi. “Save Our Rivers .” Culturama, Sept. 2017, pp. 19–24. Venkatachalam (2017) Urbanization and The 2015 Flood of Chennai. Lecture, Madras College International Guest House, 1 September 2017. Venkatachalam (2017) Economic Impacts of the Chennai Flood of 2015. Lecture, Madras Institute of Developmental Studies, 15 September 2017.